The singing talent show that has a history for producing mega stars with staying power recently got the opinion of fans for a much needed make-over. Yes, it looks like changes are a coming. 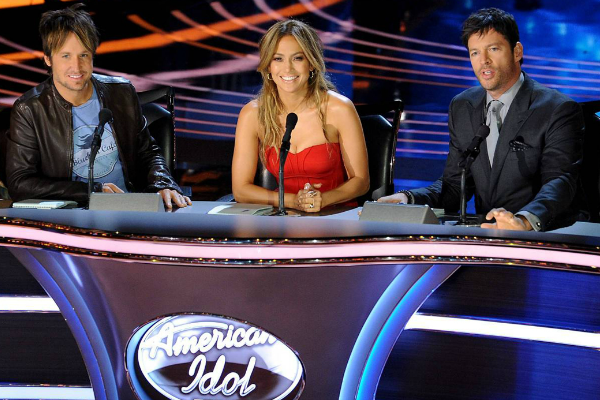 These changes may very well include how the judging panel, which consists of Jennifer Lopez, Keith Urban, and Harry Connick Jr. – a super-star winning combination, will interact with contestants on the show from the middle of the season to the live shows. 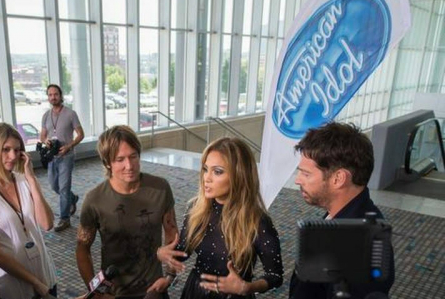 Pictured (l-r): Keith Urban, Jennifer Lopez, Harry Connick Jr.
One suggestion made was that throughout the process the Top 10 write blogs about their experience on the show. They’ll transform into more than just good singers. Overall, they’ll be MORE active on social media profiles. Contestants will sound more original. The Top 10 will perform at local venues. And, unlike “The Voice” where season 7 saw talent as young as fifteen-years-old make it to the Top 10, what if “American Idol” were to not have any contestants younger than 18? Not sure what the purpose of this would be if this flies. Contestants to perform big songs like those by Whitney Houston. Contestants may play guitar, piano, or have a pro musician play either or both instruments for them. The show may also allow artists who are represented by a manager or record company. A.I. may be changing the Top 10 on Tour to “Audience Favorites”. These “favorites” are contestants throughout the season chosen for the tour. Or, perhaps pulling talent from the Top 10 and Top 24 and they would have to fight for a spot on the tour. This season, the Top 13 might perform for three weeks without anyone getting eliminated. Then, on the fourth week, three contestants would go home, leaving us with the Top 10. The show suggests, this might be a good way of cutting down the results shows. The show may bring back a few contestants from Hollywood week and/or Rush Week. As a contestant gets eliminated, a “Fan Favorite” from an earlier round might come in and take the place of an eliminated contestant that would be part of the Top 10 and perform the following week. This may happen once or handful of times. The biggest change to “American Idol” would be if the show invites YouTube artists to guest star. Songs contestants sing will be by more current musical guests. Judges may take-on a more advisory role by giving contestants advice. The show is looking to continue to bring past contestants on as mentors. No word if “Randy’s Workshop” will be coming back. It looks like judges will give more advice to contestants in the middle round or during live shows. There may be more interaction between judges and contestants throughout season. Judges might place a vote for “most favorite” and “least favorite” performances during live shows. The least favorite vote would be for the contestant that they think should go home that week. If “American Idol” brings in current music artists to serve as “mentors”, this will be a lot like what NBC’s “The Voice” singing competition show does with it’s guest “advisers”. Another move A.I. might make, is having each of the Top 10 contestants to be paired with a successful past contestant to serve as their mentor throughout the live portion of the season. A new element to A.I. is called “True Believer Initiative”. If the contestant, that someone else suggests to the competition, wins A.I., then that True Believer wins $50,000. Another possible added bonus, is producers may show pre-screening auditions with show producers along with showing the auditions in front of the judges as we usually see them.